Learn to express your authentic self with stunning Kyanite! 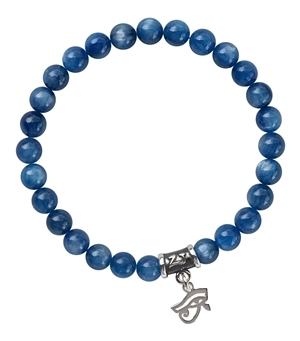 Read about our handmade Kyanite healing crystal bracelet below to see if you connect with this crystal. Kyanite is excellent for attunement and meditation. It is tranquilizing and a powerful transmitter and amplifier of high frequency energies, stimulating psychic abilities and the intuition. With its ability to tune into the casual level, this gemstone can help spiritual energy to manifest in thought. This crystal connects to spirit guides and instills compassion. Grounding spiritual vibrations, it brings spiritual integrity and maturation. It facilitates dream recall and promotes healing dreams. Kyanite is helpful for those making the transition through death. Kyanite instantly aligns the chakras and subtle bodies, clearing the pathways and meridians. It restores Qi to the physical body and its organs. In healing, it stabilizes the biomagnetic field after clearing and transformation. As Kyanite does not hold negativity, it never requires cleansing. Psychologically, Kyanite encourages speaking one's truth, cutting through fears and blockages. Opening the throat chakra (chakra 5 - Visuddha), this gemstone encourages self-expression and communication. It cuts through ignorance and opens to spiritual and psychological truth. Kyanite slices through confusion and dispels blockages, illusion, anger, frustration and stress. It increases the capacity for logical and linear thought, stimulates higher mind, and links into the casual level. Spiritually, Kyanite assists in detaching from the idea of blind fate or implacable karma. It shows the part played by the self in creating causes and the measures required to balance the past. Kyanite facilitates the ascension process by drawing the light body down into the physical realm and connecting the higher mind to the highest frequencies. 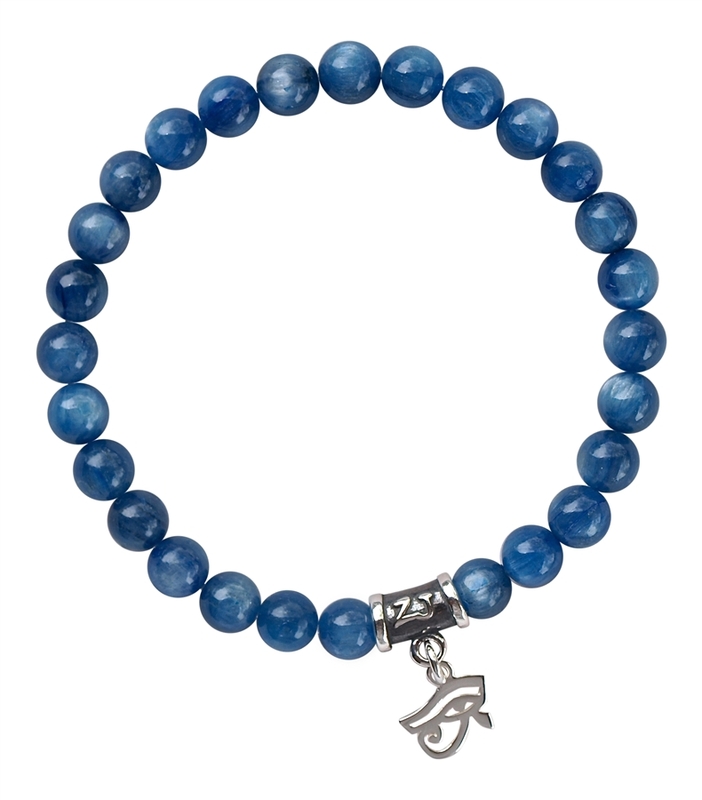 Our high quality Kyanite bracelet can assist you in expressing your authentic self! Kyanite has been known to treat muscular disorders, fevers, the urogenital system, thyroid and parathyroid, adrenal glands, throat and brain. As a natural pain reliever, it can lower blood pressure and help to heal infections. It aids in releasing excess weight, supports the cerebellum and the motor responses of the body as well as balances yin yang energy.